Hospitality is usually defined as the quality or disposition of receiving and treating guests and strangers in a warm, friendly, generous way. As you can see it is all about them, how you receive them, the experiences you allow them to have and more than anything how you go about making them feel at home. Making the guests feel at home in the industry can look like them being in a place where they feel safe, appreciated, valued and comfortable. Since it is all about your guests, it is your job to find out what they like and dislike. Remember “the customer is always right”, specially when it comes to hospitality for your guests will expect you to think ahead of all the details that will make their stay, or whatever experience your business offers unforgettable. What differentiates the options of hospitality services is that unique thing that they have to offer. You can make the quality of food unique or choose to focus on the customer service. You can choose to make your venue decor distinctive, beautiful and innovative or choose to offer specific services that no one else thought about before. Even though they are not an example of hospitality businesses Apple has made its way to success through not only developing the leading technology all around the world but they excel in customer service and keep developing the customer’s in-store experience. So it is up to you if you would like to be an average hospitality service and excel only in one of the areas or if you want to risk it and excel in all of them. One of my friends used to help out with guests relations and it amazed me to see how they think of details that at the end of the day can make the whole difference in the guest’s experience. Taking hotels as an example, if you are a part of the management team, what are some things you could offer to your customers as a care pack while traveling? Hair Dryers used to be a no go until someone realised that it might be useful to have one available in every hotel room, what is something that you would like to have available when you travel? On the other hand if you are a worker in the hospitality industry, what can you change on your greeting? your manners? How can you be more attentive or what questions can you ask to make sure all the needs of your guests are covered? 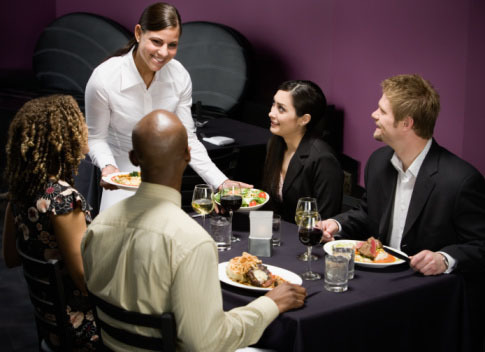 Sometimes people’s experience on a restaurant has been marked by the way they were treated and taken care of by waiters or servers. The attitude you do what you do with matters. Do everything you can as a team to make sure every customer that comes through your doors leaves better than when they came in, with a great service and feeling appreciated and valued. People will always come back to the place that filled not only their material needs but to the place who cared enough to fill up their emotional tank as well. Never cease to see your customers as people, for it is real people you are dealing with day in and day out, it is real people you cater for. 5. Let service be your priority, the rest will come. Whatever you do, wether your company consists of a chain of hotels or restaurants, or an events company, no matter how small or big it is, never forget that the heart of hospitality is service. Service does not only consist of something you do for someone else, but it is about meeting needs and helping people, it is about creating moments and facilitating goods for people who trust you to do it for them. Instead of simply buying a beautiful place and turning it into a company, you have the privilege of being a company that can turn a place into something beautiful for families, individuals, and all the guests that will have the honour of being served by you in their everyday lives. What else could be a core rule of hospitality?